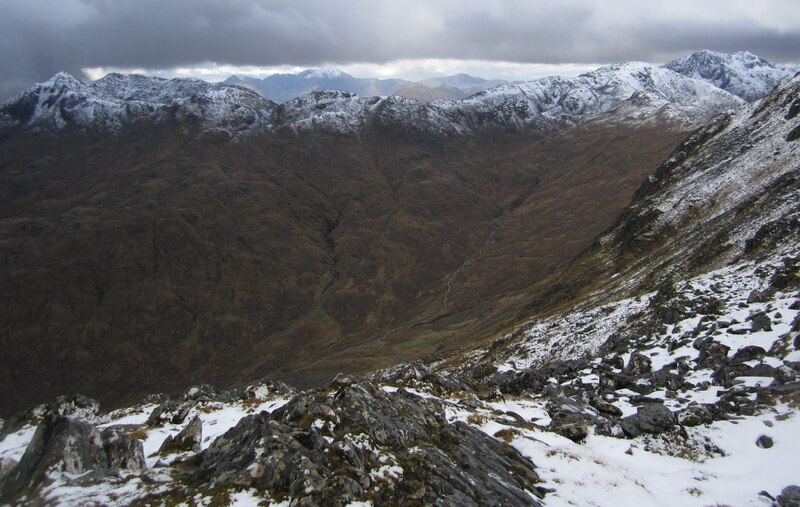 A munro-baggers' classic, this ridge of 7 munros lies to the South of Glen Shiel and the road to Skye. After completing the ridge from East to West, the route follows a stalkers path S into the remote Glen Quoich, and with most of the hard work done a great trail-run takes you back beneath the summits along Glen Loyne, then over a small Bealach to the estate road leading back to the Cluanie Inn. I'm really glad I went for it. Leaving Cluanie Inn on the road to Cluanie Lodge, with the Loch still and reflecting snowy peaks, my sense of adventure was there but a bit dampened by the expectation that I'd probably encounter ice along the ridge and have to turn back. I enjoyed gaining height easily up this gently-graded road above Loch Cluanie, eventually to a 430m Bealach from where I started expecting to find a stalkers' path branching off onto the SE shoulder of Creag a Mhaim. The snow-level was only about 300m above here. The path did appear on the right just before a little bridge, and it looked nice and gravelly and so very runnable. After a km or so this path forks - I was heading right up onto the ridge, but later today I'd be returning here from the left. The path up onto the ridge remained excellent, zig-zagging to take the sting out of the ascent and so I was quickly up into the snow. Surprisingly there were no bootprints in it! As always it felt good to reach the summit cairn, cloud came down then back up and I was still getting reasonable visibility along the ridge ahead, which at this end is broad. After some mild scrambling I was on the 2nd peak of the ridge and moving on, the NW wind beginning to pick-up as forecast. I had a third text-message exchange with my dad, he now knew it was my intention to proceed. Between the summits I was often back below the cloud base and taking in views down from the ridge, both sides, including back NE to Loch Cluanie. A couple of times I did try to run the less exposed downhill bits but the snow deepened as I headed W and rocks hidden by the snow made it a bit silly. And after the third summit - Aonach air Chirth - the ridge became a bum-cheek scramble along snow and rock. I didn't want to slip here. Fortunately nearly all the snowfall was fresh, and I did not encounter any ice. I met a couple of guys walking the other way, they were also surprised at the lack of people on this popular ridge, and said there'd been no other footprints along the way. Well they had mine to follow now, and I had theirs. The narrow ridge of Maol Chinn-Dearg was a highlight (title photo), being able to see down both sides. It goes over a bump and broadens back out to the summit at 981m, then the ridge remains relatively broad from there as it descends over a subsiduary top down to an 820m Bealach. It was along this section when the air filled with high velocity polystyrene balls. I pulled my hat and hood around such that I could only see with the left eye. I also changed gloves. For the next hour or so I didn't see much other than snow, rock, blizzard, and battered rusty fence-posts which appear along this section. I summitted Sgurr an Doire Leathain, ignoring the quickly-filling bootprints as I remembered to head slightly N from the main spine to find the summit cairn. Next was the penultimate Munro of the ridge, Sgurr an Lochain, which looks like a nice peak in other people's photos but I wasn't seeing much! Descending steeply from there, I finally got out of the murk and found myself looking across at other mountains and blue sky to the W. The snow became slushy, it was melting fast, and the Munro-baggers' path re-emerged. I got a great view over the head of Glen Quoich to the Knoydart hills beyond. As I was already quite tired, I happily ignored the 896m lump on the ridge and kept to the Munro-bagger's track which by-passes it to the S. This leads to Bealach Fraoch Coire, the lowest point of the ridge. From here I power-walked back up into the snow one last time to reach the lumpy summit of Creag nan Damh, then retraced my steps to the Bealach to pick up the top of an old zig-zagging stalkers' path down (S) into the remote Glen Quoich. This path hasn't been maintained, it was mossy, steep and greasy (yes I had a couple of slips). But it is nonetheless a reasonably safe route down onto the brilliant trail along the glen. I was really glad to reach the river-side track. After the slow progress along the snowy ridge, I immediately enjoyed this very-runnable trail back E, down to Alltbeithe then gently back up to the watershed of the River Loyne. There was one last climb to do, which was a left fork back up between the lower slopes of Creag a Mhaim and the 500m lump marked "Craig Liathais" on the OS map. I took a much-needed breather ascending this lump (somehow my phone received a text message here - my dad asking me to update if I had reception which I didn't!). I was grateful to get over this last "hurdle" and be heading back down into civilisation, now able to reply to my dad's text to let him know I just had an easy few miles down to the car. Not the sort of day I'd expected after the recent mild weather, but entertaining for sure.